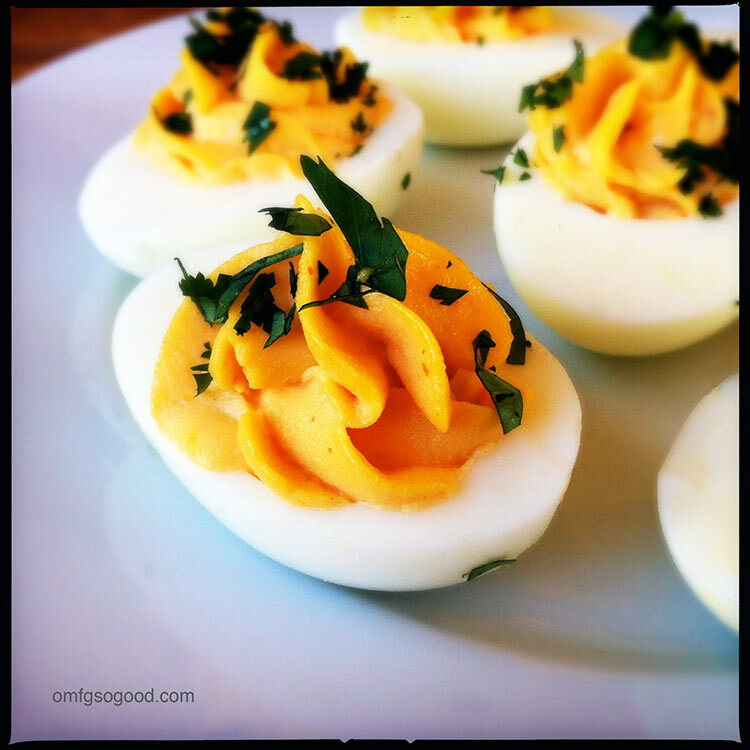 sriracha deviled eggs | omfg. so good. Last week Finley and I did a ‘test run’ on coloring Easter eggs, which gave me the perfect opportunity to bust out some of these badboys. And, since my dad happened to be visiting, I had the perfect taste-tester at my disposal. The guy voluntarily ate 12 deviled eggs over the course of two days. To boil the eggs, fill a large saucepan halfway with water and bring to a rolling boil. Gently add the eggs and boil for 2-3 minutes then remove from heat, cover and let the eggs sit in the hot water for another 10 minutes. Gently transfer the eggs to a bowl filled halfway with ice water and let them sit for another 10 minutes. Dry the eggs, peel and rinse then pat dry with a paper towel. Cut the eggs in half with a sharp knife, gently remove the yolk and transfer that to a small mixing bowl. Arrange the egg whites on a serving plate and set aside. Use a fork to mash the cooked egg yolks and remove any lumps. Add in the mayonnaise, Sriracha, salt and ground white pepper and mix to combine and get rid of any remaining lumps. At this point you can either spoon the yolk mixture into the empty egg whites, or use a piping bag and tip to make them look super fancy. To finish, sprinkle with a bit of chopped fresh cilantro. Refrigerate until ready to serve. These make for a deliciously spicy little twist on a classic post-Easter snack. YUM YUM YUM! 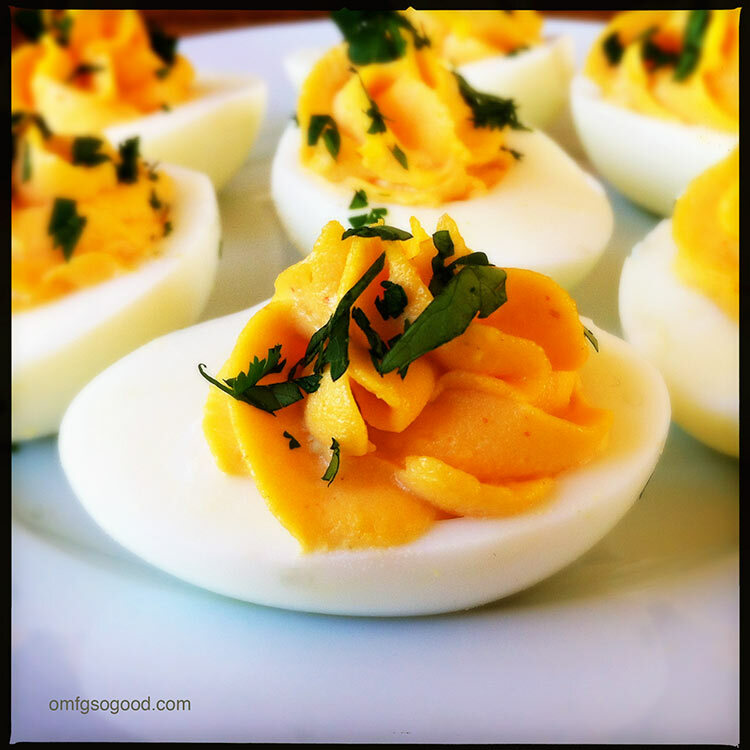 Love everything about these deviled eggs. Yum! I will eat sriracha on almost anything. 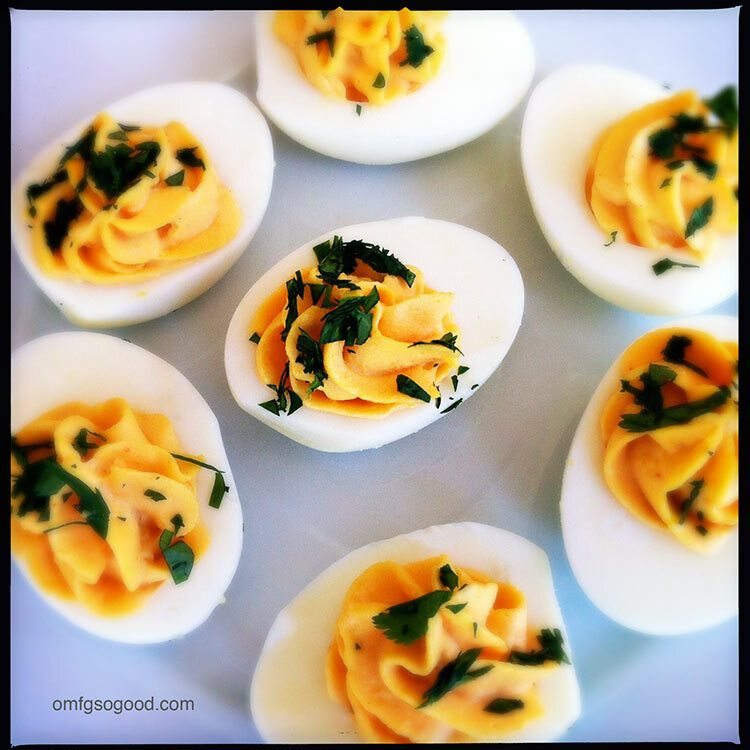 What a great way to spice up deviled eggs!